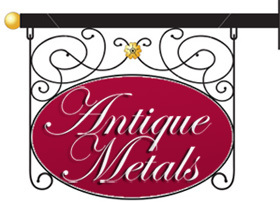 Antique Metals can take care of all your restoration and repairs of metal items. Most of the metalwork restoration we undertake is processed by hand and using traditional methods where possible but sometimes health and safety issues force us to use modern alternatives. No job too small or too big, if you are missing a piece of metal for a piece of furniture, then we can make a replacement and colour to blend with your originals or give a new lease of life for a chandelier or lantern. Take a look at the , chandelier or lantern pages for some samples of work.